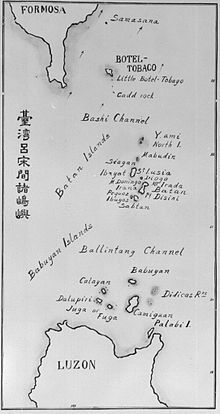 Bashi Channel is the northern channel of Luzon Strait. It lies between Orchid Island (called Botel Tobago in the map) and Y'Ami island. The Bashi Channel is a waterway between Taiwan and the Philippines. It is part of the Luzon Strait in the Pacific Ocean. It lies between Y'Ami Island of the Philippines and Orchid Island of Taiwan. The Philippines call Orchrid Island Botel Tobago. Many undersea cables use this channel. It is also important for military operations. Both Taiwan and the Philippines say the channel belongs to them. This page was last changed on 14 July 2016, at 05:31.